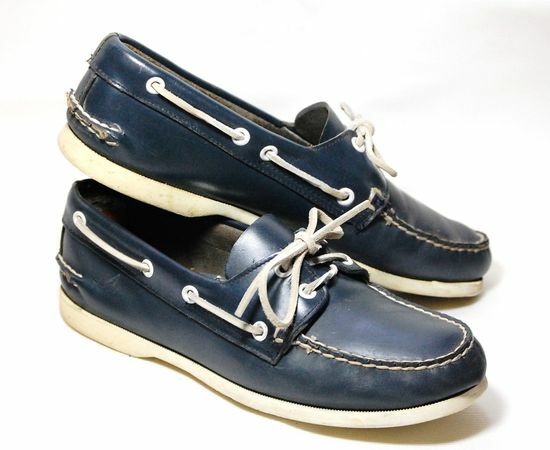 When you hear the words ‘boat shoes’ you probably imagine a pair of Sperry Topsiders. Though the company now makes other types of shoes, their staple is still the classic Topsiders. The shoes are slip on and made or a durable leather on top and a non-skid bottom that is tough enough to withstand the wind and pounding rain on the deck of a boat and yet look good enough to hit the yacht club in. Preppy look: This is a classic look that involves the Topsiders. Start off with a pair of dress shorts that are beige or tan colored and wear a bright colored Polo style shirt tucked in. A brown belt contrasts the outfit nicely and will also match the color of the typical Topsiders. When wearing the Topsiders you should not have on any socks, but if you insist on doing so wear the kind that are below the ankle so that they stay as hidden as possible. Finish off the entire preppy look with a sweater cross draped over your shoulders. Casual with jeans: A great casual look that utilizes the Topsider is jeans and a nice button down shirt. The shirt should be tucked in and again you will want to go with a brown belt to match the Topsiders. The jeans should be a comfort fit and not be worn too tightly as doing so will ruin the appearance of casual. No need to wear a tie with this look and a couple of buttons being undone on the shirt is just fine. Again you shouldn’t wear socks but if you have to opt for the ones that won’t be all that noticeable. Khaki pants: No matter what color your khaki pants are, you can enhance the look with a pair of Sperry Topsiders. You can wear a Polo style shirt tucked in or you can go with a button down shirt that is long sleeved depending on how formal you wish to look. A nice lightweight jacket completes the look if it is chilly out. You can also wear a plain black scarf that is simply draped over your neck and allowed to hang evenly without tying it at all. The no sock rule still applies. Get cute with skirts: Ladies can get cute with any type of skirt they wear as Sperry Topsiders now come in a wide variety of colors and not just the classic brown that everyone is accustomed too. Pair your favorite cute skirt with your favorite top and depending on the color find the perfect pair of Topsiders to compliment the outfit. If it is chilly out then a cardigan sweater will do the trick every time. Like the guys, if you wear socks, be sure they are hidden as much as possible. Whether you are going out on the boat or just out for a night on the town, the Sperry Topsider is the ultimate shoe that can encompass both situations and then some. Ok with no socks, not all summer though, otherwise, goodbye loafer :D.